This little warty creature thrives in the wetlands of life. With his hypnotic ribbit, Frog cleans the pond that beaver built and calls the rain to wash away the stagnant energy of frustration and disappointment that accumulates in our daily struggles. Weeping is the rainy weather of the soul that frees our body and mind of all the pain we have endured so our spirit can arrive at a sense of a job well done. Frog teaches us how to leap across the distances between our infinite hopes and our limited reality by dropping the weight of disappointment through the process of crying. 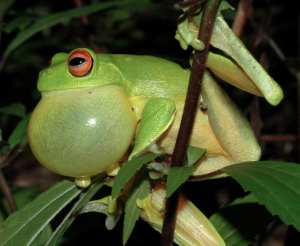 Calling on the cosmic powers of frog lets the tears swell that will wash away our disappointments and prevent the stagnant feelings of cynicism to gather. Frog teaches us how to not drown in our pain and how to leap forward in difficult environments that want to consume our hope and ambition. There is nothing more important to do in life except keep trying. Trying is life, which can often make life trying. 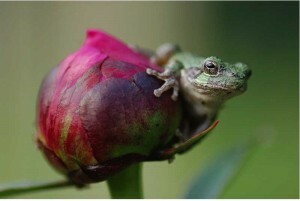 But frog says, rest and rain when you are tired and leap when the energy takes you. If frog has landed in your day, it may be time to put down the appointment book and let the storm clouds break. Take a bath, visit the ocean or a nearby lake and commune with water, the basic building block of your body. Frog’s totem speaks of how to embrace the frustrations of being a pollywog in the humbling cycle of transformation as we struggle to improve our abilities and life situations. She also teaches the Native wisdoms about the modern disconnect between paper money and the ultimate value of material goods. In Western traditions, when the princess kisses the frog he becomes a prince. When we are able to open our affection to that which we perceive as repulsive, the very repulsion becomes a beauty. Judging certain feelings as repulsive rather than embracing them in all their lumpy unpleasantness prevents those feelings from maturing into the beauty inherent in their deeper meaning. Admitting to feelings of jealousy, resentment and all the other ignoble qualities we feel begins the process of transforming the little monsters in our personality. 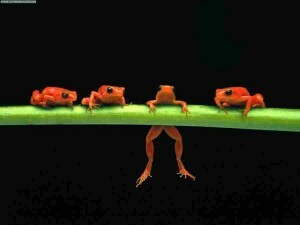 It is difficult to detect lurking judgments in our psychology that limit us but Frog medicine asks the hard questions. Are you judging the outward appearance of someone or something? Is your judgment creating a toxic environment? Judgment is a spontaneous reflex that occurs in us due to the limitations of our upbringing. Every upbringing was limited in order to insure survival but as we arrive at adulthood we learn how to let the world get larger. 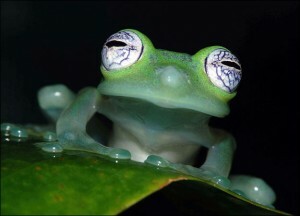 Frog asks that we take a look at the physics of how emotions function. An emotion, a true, unthinking sensational feeling, lasts only seconds. Once felt, we then often enter a maze of thoughts about what it meant, about who we are as a person for having felt such a way, and was it ‘right’ to feel that? But humans are designed to feel. We are comprised of five senses who’s only job is to… sense things. Placing judgment on an internal process that is our natural state of being creates monsters and makes life unbearable. It takes seconds to feel the truth of an emotion but we often can spend a lifetime trying to prevent a feeling from moving through us which we’ve decided is ‘unacceptable.’ This judgment of our internal weather blocks the truth of how we feel and denies reality. This will eventually manifest physical pain or compel us into outlandish behaviors that will force us to deal with the causes. The lesson behind ‘kissing a frog’ is to allow all forms of experience into our body and follow them to the inevitable transformation of grace that feeling emotions will cause. Frog medicine asks that we learn how to feel the ugly feelings and see the prince waiting to transform inside that ugliness. As an amphibian, frog experiences a major shift in reality as he transforms from a pollywog to an adult hopper. In this way frog gets to live two distinct lives in one lifetime. Humans also have this ability to transform, but we can do so multiple times in one lifetime if we allow emotional processes to run their full course in us. We are not the same person we were at the age of ten or twenty and as our world gets bigger we are constantly finding ourself returned to a state of limited resources. The pollywog has no other resource save his excitement for life. He swims and propels through the stuff of life with a pure and ambitious energy and slowly starts to develop arms and legs and other tools to play with his pond more completely. There is a frustration in our limitations, but if we allow those frustrations to crush our spirit we leave the very effort that will see us through to greater freedom. Frog says keep loving, keep hoping, keep swimming with all the energy you have and one day that effort will propel you forward in a great leap upon new shores. 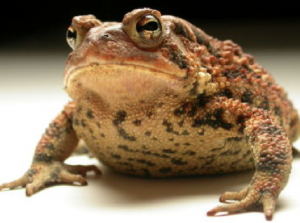 Frog medicine is a masculine energy of a destructive nature. Destruction is necessary for balance and it is good sense to let the storms in to clear away the obstacles to progress. It is often thought in western psychology that weeping is a feminine quality that men are not prone to do. The notion that weeping is only for women or that it denotes weakness is a tragic misunderstanding of where true strength comes from. Crying is a practical necessity of life and to avoid it or judge it as wrong to do is denying the nature of your being. We weep. There is no end to the depths of human grief. Intolerance of this fact leads to anguish without end. But the moment we accept our need to cry, that anguish does finally find an end. If you have not felt the swell of tears in a few months your experience of life may have become too callous and removed. Even if there is no cause for grief or sadness, it is always good frog medicine to open to some form of beauty, a song, a gesture, that will bring the tingle of tears back into your heart. Keep the heart wet and warm with feeling. But perhaps it has been months and you’re still crying! Oh, dear! And congratulations! You’ve found a deep, secret reservoir of dark and winding ways. 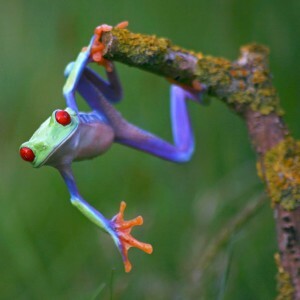 Frogs message in this situation is to not lose patience with yourself or think that you are somehow permanently broken. Tears that don’t stop are an invitation in to a much deeper shamanic transformation and are an indication that you have located an authentic resonant spiritual opportunity for growth. When tears go on and on, it may start to feel like it is time to get stern and ‘get back to work’, but the truer message in such a process is to figure out how to reach the bottom of that pond of sorrow. The only way to do that is to let it flow and follow it where it goes. Gentleness is always the only right response to a state of crying no matter how long it lasts. Rest assured, you will not cry forever. Trust the inherent healing properties of the process and you will arrive into clarity. Judgment or impatience to ‘stop acting that way’ will never heal the basic confusion hiding behind the tears. Despite our desire to treat feelings like mathematical calculations that add up to tidy sums, the process of crying takes an unknown amount of time and stopping that river flow will never carry you to the larger ocean of experience. Frog asks if you are brave enough to not interfere with the rate of the process. Are you willing to change your current plans in life to accomodate the truer current of energy moving through you? If you are dealing with a friend who is in that weeping river, can you be the space of day and sky to let those waters gather how they will without judgment of how you think they need to toughen up and ‘deal with it.” That notion, ‘deal with it’ is devoid of any sort of real guidance and actually implies the idea of, ‘repress it and get back to work.’ But as we do navigate the confusion of tears and what they mean about who we are, frog also asks very gently if you might be wallowing in self pity? There is a difference between an unstoppable grief and a manufactured addiction to drama. Only you can ask yourself and answer to the authentic integrity of your process. Be honest. If you are seeking out activities that make you cry because the intense process makes you feel alive, Frog asks you to leap out of that pond and find a new interest. Others can also sense the authentic integrity of your sadness. If you have sought advice from a friend but have not taken it to heart, what else will they be able to say to you if you continue to ask them for help? One of the most common causes for tears is the cultural phenomenon of money. Before Western perspectives dominated Turtle Island (North America), the concept of trading with money was unknown to the indigenous tribes living here. All exchanges were of a concrete and unique value in the form of skills, crafts, and effort. When the white men brought the French franc, the British pound, and all the other currencies of Europe, the native tribes called their money ‘dead frog skins’ as there was no life or community in paper money exchanges. They found the displacement of value confounding and did not see the larger importance of little pieces of paper and silver, often using the coins as decoration on garments rather than participating in the strange and unnatural exchange. Money is no longer in harmony with inherent worth, and Frog medicine explains that it is up to each individual to determine the value of an object or an exchange. A high or low price tag does not accurately represent the resonate value of a thing. Integrity is what determines the value of an object and that is obtained only by the time and effort it took to produce the object. Time spent in focus creates value. But today, money is the way we trade and frog medicine suggests we put effort into connecting with the people involved with giving and taking our money. Who are they? What are their values? Connecting to the way we spend our money reminds us that we are a very real force of power and our decisions do have an effect on the world. Frog knows that prosperity has nothing to do with the size of a bank account. Prosperity is how we enjoy what we have and finding ways to reconnect to the community of commerce also contributes to a deeper understanding of how you affect the pond you live in. Your choices matter more than you are able to perceive and your actions have lasting effects. One of the most essential teachings of Native Ways is to honor ones elder’s. In native teachings there are three stages of life; the Child, the Adult, and the Elder. The Elder is the most highly honored position among Native communities who recognize that the health and wellness of the individual is inextricable from the health and wellness of the tribe which is only possible due to the unbroken chain of effort of ones ancestors who survived the trials of life. Elders are the guides who tell the tales of instruction passed down from generation to generation by the sacred fireplace. It is likely that your experience of family was not filled with such community and wisdom. Frog medicine asks that you let yourself grieve for that reality and begin the journey to become an Elder for others. In Western culture parents can be very difficult to honor and respect. Many people become parents before they are adults. An adult is not someone who has reached physical maturity. An adult is someone who has created space between their reactions to life events and is able to prevent further confusion or pain. An adult assists in deepening communication and assumes responsibility for problems regardless of if they caused the problem or not. To not assist in dissolving a problem is to be part of the cause of it. It can be quite confusing for children as they find their way in life when they do not realize that they are being raised by children themselves. All parents have parents and it is likely that the shortcomings in their parenting is due to a frustration with their own upbringing. But it is not the child’s responsibility to process the parents’ limitations. And it is not an insult or disrespectful to recognize when a parent is not acting like an adult. To recognize such situations is to move towards adulthood. If every individual followed that inner process of cleansing it would be possible to leap out of that whirlpool of inherited limitations. Heal your own pain and confusion and let go of others as they find their way as well. Don’t let one person’s reluctance to jump prevent you from making your own leap forward on your path to maturity. Stay on your own path to become a valued elder. Contrary to our childish hopes, it is not possible to become an Elder any faster than the years will unfold. To become an elder takes a lifetime of learning.